I started the day with a high pain day and ended feeling amazing from today's workout! I did the entire 52 minute 10 Minute Solution Pilates DVD (all five segments) and I LOVED every minute of it! 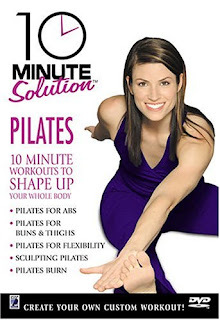 I've never, ever (and this DVD used to be my favorite) been able to do the entire 52 minutes before and I was able to to do every exercise! I sweated like crazy, my legs feel like jello and the most important thing is that I loved every minute of it. Maybe this whole time the problem was that I was getting burnt out on the same type of strength training that I've been doing for, what, two years now, and I just needed a huge change and that's why my workouts kept stalling and fizzling out? Anyway, cardio tomorrow and then I have, like, 166 other DVDs to choose from on the Amazon channel I found the workout on. My biggest fear this whole time was that the DVD's moved too fast for me but after all the weight I've lost, they're not too fast anymore! So maybe I won't be building serious muscle right now but as long as I'm doing something and actually enjoying myself, that's what counts, right? And eventually I'll be back at the serious stuff but right now I need a break from it. And I have pilates, yoga, weights, dance, cardio, barre and all sorts of other DVD's to choose from to keep me from getting bored! I am so pumped and excited and I actually can't wait to work out again! !